Alarmco provides all of your security guard needs whether it is a standing post, roving patrol or emergency service. Our professional security guards are uniformed and fully licensed with Clark County and the State of Nevada. Each of our guards has passed a nationwide background check to ensure the integrity of our services. 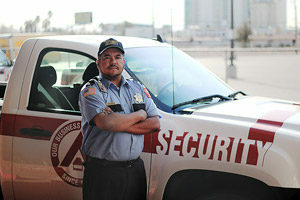 Alarmco’s security guards are dispatched 24/7 through our local dispatch center. Our security guards drive full-sized, marked vehicles to every assignment. Alarmco can provide services for your short or long term needs. If you have an emergency, we can dispatch a guard to your location day or night. Roving patrols are available for residential and commercial services. Alarmco can add perimeter and yard checks to the patrol to increase the security of your home or business. Our guards are in communication with our local dispatch center 24 hours a day. Standing guard services always include a large marked vehicle parked at your location. Perimeter checks are completed at different intervals throughout the assignment to further increase your protection. Alarmco’s guard services protect your property after a breach of security or provide firewatch duty in compliance with fire department regulations. Standing Guard Officers are unarmed, fully uniformed & licensed individuals, trained to identify possible threats to your location. Alarmco can customize security details specific to your location and needs. Our roving patrol services provide you with a cost effective way to protect your assets without the need for a permanent onsite security guard. Alarmco can provide marked security patrol vehicles and uniformed guards to inspect your premises ensuring that site security is successfully maintained in the absence of the home or business owner. Roving patrols are conducted using random routes and intervals, particularly during weekends and holiday periods. Alarmco also provides an emergency / temporary guard or patrol service for a variety of scenarios and last minute emergencies. Firewatch includes property, building or inventory watch based on an existing fire hazard or during construction or remodel when life/safety equipment has yet to be installed or must be disabled for a specified period.